GlaxoSmithKline’s Shingrix vaccine was recommended by the CDC as a more effective preventative. GlaxoSmithKline's new shingles vaccine was voted the preferred treatment to prevent the shingles virus in people 50 and older because it produces a stronger immune response and lasts longer than the existing vaccine made by Merck. 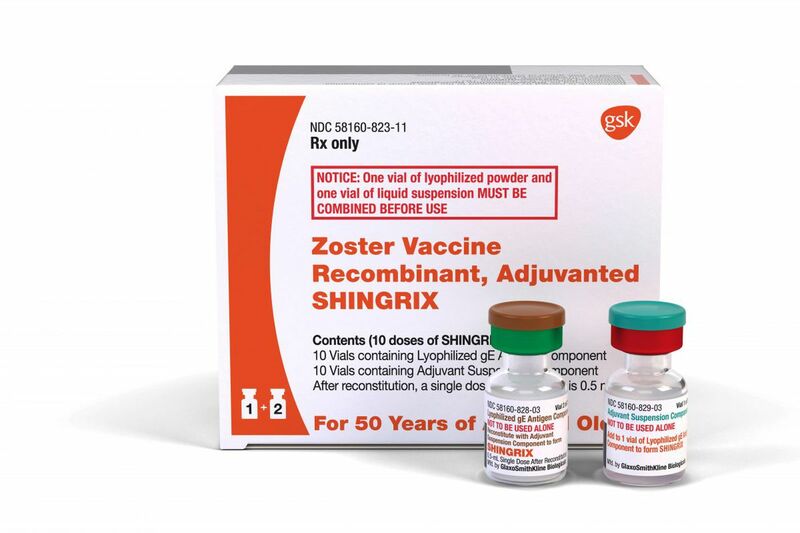 The Centers for Disease Control and Prevention's advisory committee on immunization practices voted 8-7 on Wednesday to recommend that doctors choose Shingrix for their patients instead of Merck's older Zostavax inoculation, which has been available since 2006. Those members voting no wanted to see longer-term safety data on a larger population. Several speakers expressed concerns about supply issues if all physicians use it. "I will recommend this vaccine for myself and my family members. It's a great vaccine," said Carol J. Baker, a professor of pediatrics at Baylor College of Medicine in Houston and a former committee chair. "I am cautious about making a preferential recommendation. Stuff happens in the real world. What happens if there is a supply issue? It's a brand-new adjuvant that hasn't been given to millions of people. I'd like to get more data outside a clinical trial." The CDC advisers voted overwhelmingly that people previously vaccinated with Merck's vaccine can safely receive the two-dose Shingrix vaccine at an interval as soon as eight weeks, leaving the timing to doctors and their patients. GSK said the vaccine would be available to physicians starting at the end of November. Commercial insurance plans should begin covering it in early 2018, the company said. Insurers usually cover medicines recommended by the CDC. "This is a great day for patients. The recommendations today highlight the benefit that Shingrix can bring for patients," said Leonard Friedland, GSK vice president for scientific affairs and public health for U.S. vaccines. "We're excited because there was tremendous confidence in this committee for the benefit that this vaccine can bring for patients to help avoid substantial numbers of cases and the complications of shingles." The GSK vaccine, approved Friday by the Food and Drug Administration, is a potential $1 billion-a-year drug. For those without insurance, the vaccine will cost $140 a dose, or $280 for the series of two shots, GSK said. In the company's clinical trials, two doses of Shingrix had 90 percent protection against shingles in adults 70 and older compared with a placebo. The effectiveness went down only slightly, to 88 percent, after four years. By contrast, Merck's vaccine, according to a Kaiser Permanente study of adults 60 and older, decreased from 68.7 percent effectiveness initially to 4.2 percent in the eighth year after vaccination. For adults over 65 on Medicare, only those with a Medicare Part D prescription-drug benefit will get the shingles vaccine paid for. Regular Medicare does not cover a shingles vaccine. As a result, only 31 percent of people 65 and older received Merck's vaccine. The life-science analysis and forecasting firm EvaluatePharma predicts that Shingrix will have blockbuster sales of $1.126 billion by 2022. Sales of Merck's Zostavax were $685 million last year. GSK's vaccine is recommended for people 50 and older. Merck's vaccine was approved for adults starting at age 60. There are 42 million Americans between ages 50 and 59 who can now be vaccinated, and an additional 20 million vaccinated in the past with Zostavax who can now be revaccinated with Shingrix, Friedland said.